I never considered myself a ‘Cruise’ person. In fact, the very idea of being trapped on a large ship with several thousand other people always sounded like a horrible travel idea to me. 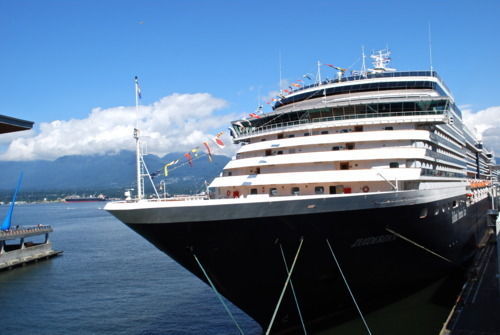 But, since I had always wanted to go to Alaska and I can’t say no to a free trip, I found myself boarding Holland America’s Zuiderdam ship in Vancouver and setting off into the Inside Passage! A trip through the Yukon just wouldn’t be complete without learning a bit about one of the Territory’s most popular sporting events – dog sledding! 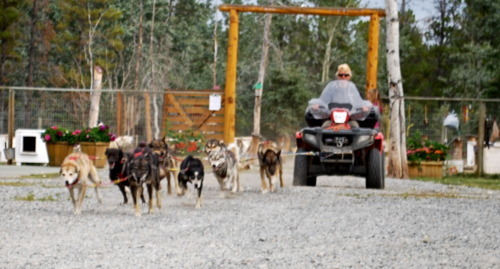 Since it was still summer here, we weren’t able to go out sledding, but we were able to visit some of these incredible dogs that were raised to pull a dog sled. Uncommon Journeys is located in the Ibex Valley, just outside Whitehorse, and is surrounded by beautiful Northern-Canadian wilderness. The company was founded and continues to be run by Rod and Martha Taylor. The couple are well-respected members in the Yukon tourism industry and are both experienced wilderness guides. Their love of the Yukon outdoors and their beautiful sled dogs led them to opening Uncommon Journeys, which allows them to share this love with those seeking adventure in the Canadian North.Walking into a dog kennel, you expect a lot of noise, especially with over 50 dogs living here. But the kennel was virtually silent as the dogs quietly watched us as we learned all about their lives at Uncommon Journeys. The dogs here are considered part of the family and around 80 per cent of the dogs found at Uncommon Journeys were born and raised here. The remaining 20 per cent were brought to the kennel from world-class sled dog racers who wanted their dogs to go to a nice “retirement” home after finishing their racing careers! These dogs are quite a friendly bunch and love meeting the thousands of guests that visit Uncommon Journeys each year to learn about dog sledding and the Alaskan Huskies who live here. After hearing stories about how the dogs are trained, socialized and cared for, we got to head into the main dog yard to meet the energetic beasts. Though they are all tied to their doghouses, this doesn’t stop them from running over to lick your hand and rub up against you as you pass by. They are very affectionate dogs who love to be petted and to give you some kisses or even a high five! The main reason these dogs are so calm and affectionate is the way they are socialized. Here, the mother gives birth in the Taylor’s house and the puppies are around people from the moment they’re born. When it’s time for the pups to open their eyes, the mother is taken away momentarily so that the first thing the puppies see are Rod and Martha, who become their “parents.” The pups love to follow “Mom” and “Dad” around the house as they begin to explore. Then, Rod and Martha’s six-year-old daughter and her friends take over the puppy socializing by spending hours playing with the pups. By the time the puppies begin their sled dog training, they are so used to human interaction, loud noises and rowdy play that nothing shocks or spooks them and they genuinely love being around people. Even as adults, there is a “dog of the day” at Uncommon Journeys, and that lucky dog gets to roam free, eat with the family, and sometimes even curl up at the foot of the Taylor’s bed! It doesn’t take long to realize that these dogs are truly loved and the care they receive here is incredible. 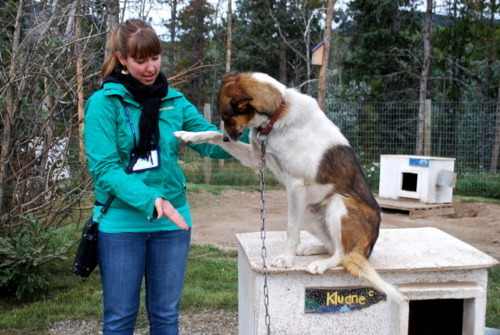 Uncommon Journeys is the first kennel in Canada to be certified at P.R.I.D.E’s highest level. 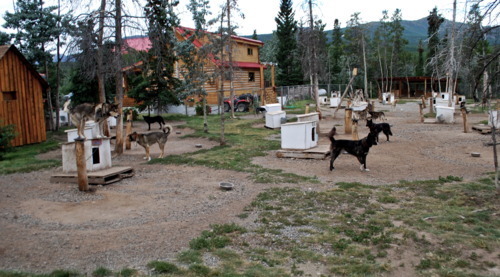 P.R.I.D.E, Providing Responsible Information on a Dog’s Environment, was started by a group of top dog mushers in Alaska to support the humane treatment and care of sled dogs and has since grown to represent mushing interests across North America and the world. 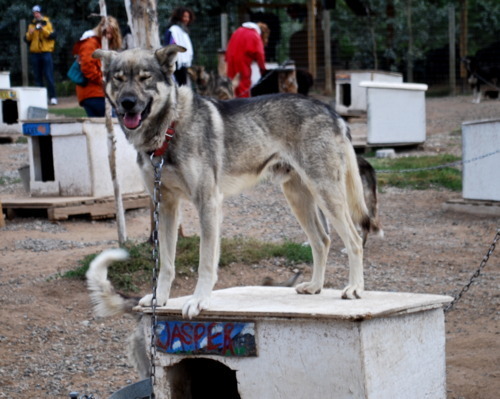 Walking into that dog yard, it’s hard not to fall in love with these friendly Alaskan Huskies. However, they didn’t look like I expected them too. Alaskan Huskies, unlike the beautiful Siberian Husky, don’t have a unified look. I learned that this is because there was a huge shortage of dogs in the North during the Gold Rush, so people began to steal any dog they could find that was bigger than a Schnauzer from Seattle to ship up North! Over time, a new breed of dog developed that could withstand cold Arctic temperatures and that loved to run and pull a sled. While there was quite a range of appearances found in the dogs in the kennel, there was no mistaking that these were Alaskan Huskies as soon as the harnesses came out! 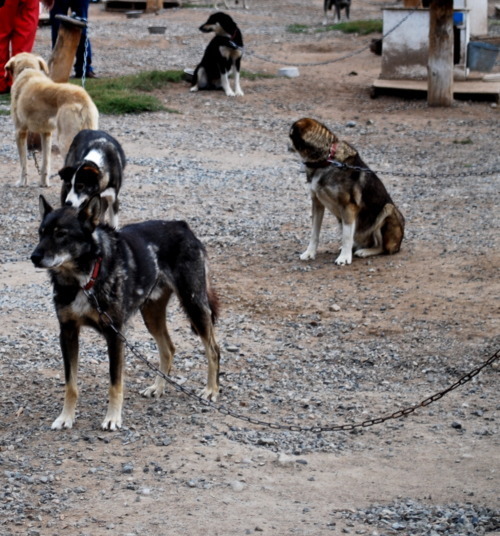 Before we left, the staff hitched up a team of dogs so we could see them in action. Since there wasn’t any snow, they were hitched up to a modified ATV with the brakes on. Brakes or no brakes, as soon as the peg was lifted, they were gone, whizzing past us in a matter of seconds. It was definitely an impressive sight and after spending a few hours here learning about the dogs, I began to think that maybe dog sledding through the Yukon wilderness might be a great future adventure….I’ll just need to bring A LOT of warm clothes! It may have been gold that brought Canada’s Yukon Territory to the world’s attention during the Klondike Gold Rush of 1897-1898, but it’s the rich history, vast wilderness and beautiful scenery that keeps intrepid travelers heading into Canada’s North. As someone who is always cold, driving through the Yukon may not seem like the best vacation for me, but after looking at photos of the beautiful landscape found in the Canadian North, I bundled up, grabbed my camera and set off on a fantastic road trip. From Skagway, Alaska, we took theWhite Pass & Yukon Route train to Fraser, B.C and then continued by bus into the Yukon Territory. I’ve always been curious about the Canadian North, and its vastness and beauty had me captivated immediately. Our first stop was in the small village of Carcross, Yukon, where the Klondike waterways, scenic drives and the White Pass & Yukon Route Railroad all converge. This historic town is perhaps the most photographed town in the Yukon. Buildings dating back as far as 1898 can still be found in use here, like Mathew’s General Store, where you can find everything from moccasins and furs to ice cream and postcards. Just outside of town lie the barren sand dunes of the world’s smallest desert, the Carcross Desert. Continuing north along the South Klondike Highway, are the turquoise-green waters of Emerald Lake. The striking rare green colour of this water is created from the sunlight reflecting off of the Mari, a white calcium carbonate that settles on the bottom of the lake. Beyond Emerald Lake stands the Gray Ridge Mountain at an elevation of 6085 ft, making this stop a gorgeous photo opportunity. In between each settlement, you find yourself with miles and miles of nature and open road. There’s definitely no rush hour or traffic congestion on the Yukon’s highways! It’s not until you reach Whitehorse, the territory’s capital, that you actually find yourself around other vehicles and meeting pedestrians on the street. Whitehorse was originally named by the gold miners who thought the rapids at Miles Canyon looked like the manes of white horses running by. The city began as an encampment in the late 1890s as a logical layover for the gold rushers heading north along the Chilkoot Trail to Dawson. The city’s next big population boom came during World War II, as soldiers entered the region to build the Alaska-Canada -“Alcan” Highway. Today, Whitehorse has around 26, 000 people and is the Yukon’s centre for communication, transportation and commerce, and is the home of the territorial government. It’s also here that you will find Walmart, McDonald’s and a truly Canadian landmark; Tim Hortons! Continuing along the Alcan Highway, we came to the village of Haines Junction. Known to Yukoners as “the Junction,” Haines Junction sits at the corner of Haines Road and the Alaska Highway, nestled at the edge of Kluane National Park and Reserve of Canada. Kluane National Park is part of the largest internationally protected area in the world, made up of four interconnected wilderness parks in Alaska, B.C. and the Yukon, covering 21, 980 sq km of protected wilderness. The park, which hosts the Northcoast Mountain range, ice fields, valleys and lots of plant and animal life, has been designated as a UNESCO World Heritage Site. Kluane National Park sprawls along the side of the Alcan for miles and miles as we continued our drive through the Yukon’s rugged beauty. Not too far from Haines Junction is Sheep Mountain, located on the shores of Kluane Lake. This area is home to several backpacking adventures and day hikes around the park as well as almost guaranteed sightings of the Dall sheep that call the mountain home. Back on the road, we came across our first Grizzly bear of the trip – such an amazing sight! After another day on the road, we arrived in Beaver Creek, Yukon, the most western settlement in Canada near the Alaskan border. Depending on who you ask and the time of year, the population here is between 99 and 140 people; a pretty small community, but we were warned that they know how to party! The Beaver Creek Westmark Inn is a cozy, single-bed, no – tv – or- phonekind of lodge reminiscent of childhood days spent at camp. The Inn’s best known for its dinner theatre, “The Beaver Creek Rendezvous,” which is performed nightly during the summer in the dining hall. As another day broke, we headed out into the crisp Yukon air to continue our drive to the Alaska border. 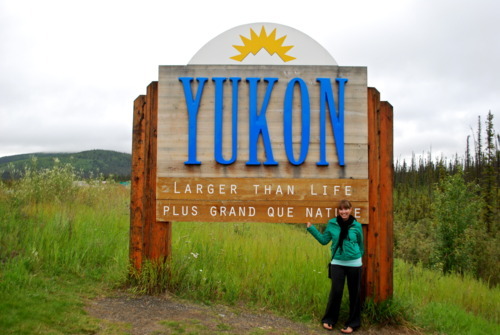 The signs here all say “Yukon – Larger than Life” and after spending a few days driving through this vast, ruggedly beautiful landscape, it’s definitely been a larger than life experience!